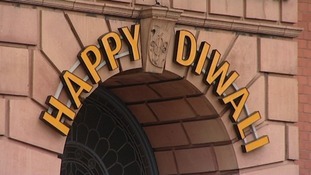 Celebrations are underway in Leicester tonight for the Diwali "Festival of Light". Thousands of people are expected to attend the celebrations tonight on the Belgrave Road. A busy Belgrave Road before it's closed at 6pm for tonight's Diwali celebrations. Many groups of families and friends have already descended upon the Golden Mile. Thousands of people in the Midlands will take to the streets tonight to celebrate Diwali with some local businesses calling it the most important financial period of their year. Leicester's Golden Mile is hosting the biggest Diwali celebrations in the world outside of India. Companies say that in these tough economic times the festival is critical for their businesses. Dharmesh Lakhani from the Belgrave Business Association says "it's more vital that we do good business throughout Diwali, so that we'll be fine for the next year." The Diwali celebrations taking place in Leicester are the biggest in the world outside of India. These pictures show women at a Hindu Temple in Leicester. They are creating rangoli which is Indian folk art, as part of the celebrations.